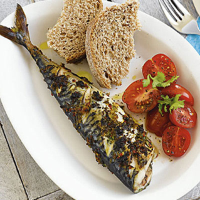 Grilled mackerel, packed with essential Omega 3 oils, is simple to prepare and ready in minutes. Make 4 diagonal slashes across the mackerel on each side, cutting down to the bone. Place in a shallow dish. Make the rub by mixing the chilli, lime zest and juice, olive oil, coriander, garlic and a little sea salt. Place one-third of the rub into the cavity of each fish and rub the remainder over the skin. Cover, place in the fridge and marinate for 30 minutes-1 hour. When ready to cook, preheat the grill to high - or heat the barbecue, making sure the coals are glowing red under a thin layer of ash before you start cooking. Place the mackerel on a grill rack, drizzling over any remaining lime juice from the rub, and cook for 6-7 minutes on each side until the skin is crispy and the flesh just-cooked. Serve the mackerel with a fresh tomato salad and chunks of floury wholemeal bread. Ask for the head of the mackerel to be removed at the fish service counter, if you prefer. When time is short, just squeeze a fresh lime over the fish and sprinkle with salt before cooking. Riesling from New Zealand, has floral notes, sweet citrus flavours and a mineral complexity. A refreshing apéritif, it is good with spicy chicken, white meat and fish.